The data structure that represents a message now contains additional new fields on top of all the existing fields your app may be currently expecting. The new structure took effect on February 13, 2019. These changes come with Block Kit—a new set of components for Slack apps that can be combined to create visually rich and compellingly interactive messages. You can read more about Block Kit below. Even if you aren't using Block Kit to compose messages, its launch still affects the data structure of messages received via our APIs, so read on to learn how to prepare your apps. What do blocks look like? Blocks now appear in the data structure of messages retrieved via APIs like conversations.history or sent via the Events API. Blocks also introduce more interactive options for app developers. They provide visually cleaner ways to incorporate buttons or menus, as well as new interactive elements like date pickers or overflow menus. Check out the Block Kit documentation for how-to guides and reference material. A message that includes any blocks now carries a new field, simply called blocks. Depending on how your app is built, you might need to change it to accommodate this new field. The blocks field is an array of block objects, and can be included at the 'top-level' of a message structure, or within the existing attachments field. "text": "Hello, Wally!\n*André* wants to know where you'd like to have dinner tonight. Please select a restaurant:"
"text": "*Café des Artistes*\n:star::star::star::star: 1528 reviews\n Excellent location for a long conversation with friends and a few glasses of wine. They have something for everyone here." "alt_text": "alt text for image"
"text": "*Kin Khao*\n:star::star::star: 1638 reviews\n The sticky rice goes wonderfully with the caramelized pork belly, which is absolutely melt-in-your-mouth and so soft." 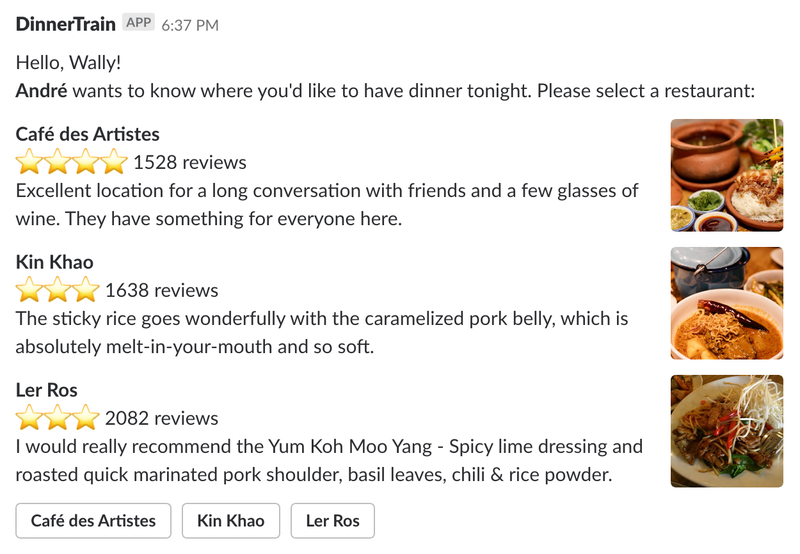 "text": "*Ler Ros*\n:star::star::star: 2082 reviews\n I would really recommend the Yum Koh Moo Yang - Spicy lime dressing and roasted quick marinated pork shoulder, basil leaves, chili & rice powder." These examples show some of the available blocks, but your app only needs to be prepared for the existence of the blocks array. Further details about each of the block objects, and the fields within them, can be found in the Block Kit documentation. If your app doesn't receive messages, either directly via a Web API like conversations.history or indirectly when it gets pings from the Events API, then nothing is exactly what you should do! If it does receive messages, then your code might be assuming a specific format or structure of JSON response, and the addition of the blocks field could cause some code comprehension consternation. If your app only publishes messages, don't worry - Block Kit is an additive change, and doesn't break any existing message composition options. Block Kit has officially launched! Read more about the new features available within the land of blocks. Keep an eye on the main changelog for more updates about Block Kit.